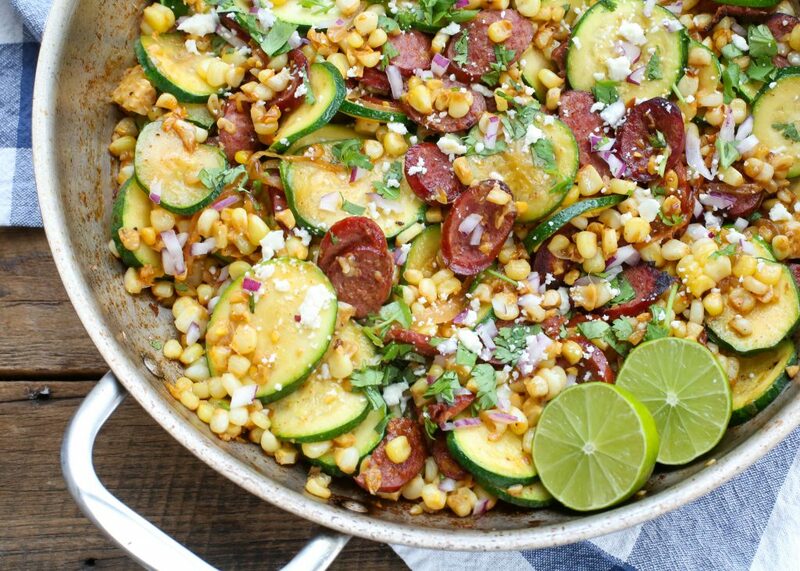 Inspired by my love of Mexican street corn, this Skillet Mexican Street Corn with Squash and Kielbasa brings all of those flavors and more to this one skillet meal. Kielbasa sausage is sauteed with sweet onions, fresh corn, and summer squash before being tossed with a creamy street corn style sauce. My family went crazy over this fast dinner. Squeeze a lime over the top, sprinkle with cilantro, red onions, and Mexican cheese while it’s hot. 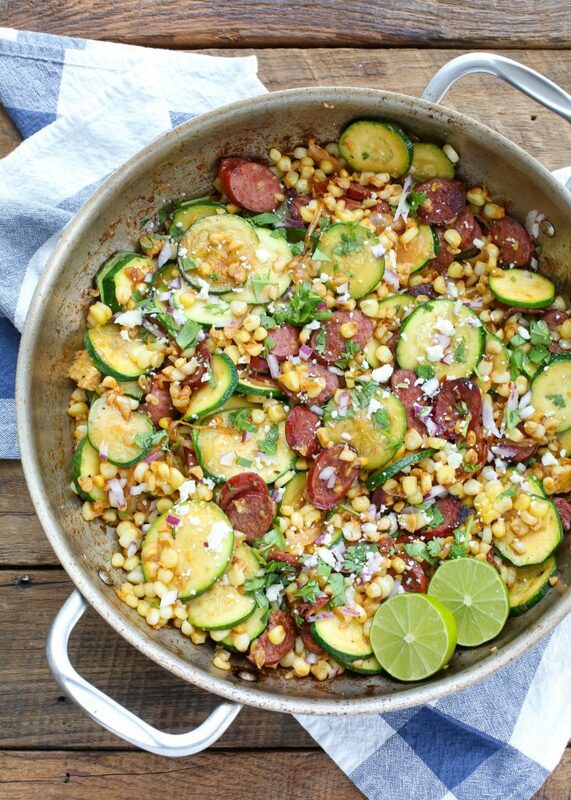 All the flavors shine in this Skillet Mexican Street Corn with Squash and Kielbasa. I have a weakness for pretty much any dish that is reminiscent of Mexican Street Corn. It started a few years ago, when we visited Elote Cafe in Sedona, AZ. Let’s take a moment to remember their hot corn dip called “Elote.” It is truly one of the best appetizers I’ve ever had. Lucky for me, Elote’s Chef/Owner Jeff Smedstad has written a cookbook sharing all of the restaurant’s recipes. (FYI – I bought the cookbook before I’d even finished the first course of our meal.) I’ve made several recipes from the book (check out these Chipotle Mushrooms and the Spicy Cabbage too) and I still try to stop and eat there every time we visit Sedona. I’ve been known to plan trips around the restaurant’s hours. This simple skillet is a hearty meal on its own, but it’s also delicious served with roasted potatoes and/or warm tortillas. 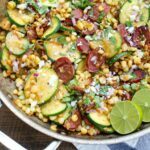 If you’re looking for more street corn inspired recipes, these Mexican Street Corn Deviled Eggs and this Spicy Mexican Corn Salad are both on my list to try soon. Kitchen Tip: I use my favorite skillet to make this recipe. Remove the kernels from the corn and set aside. Warm the oil in a very large skillet, over medium high heat. Add the yellow onion and kielbasa to the skillet and saute 4-5 minutes, stirring frequently, until lightly browned. Add the corn and the squash. Cook, stirring frequently, until barely wilted and still slightly crisp, about 2-3 minutes. Stir together the butter, mayonnaise, salt, chile powder, and cayenne. Add the mixture to the skillet. Stir well to coat and remove from heat. Drizzle with the lime juice and sprinkle with the red onion, cheese and cilantro. Stir to combine. Serve with lime wedges, for an extra kick of lime, if desired. COOK’S NOTE: This recipe can also be made with (thawed) frozen corn or canned corn. Drain any excess water off the corn and then follow the recipe as written. Cotija can usually be found with the dairy products in most grocery stores. Feta cheese can be substituted for the cotija if necessary. Talk about total summer comfort food, Mary! Can't wait to try this amazing dinner idea - Pinned! my favorite kind of meal.... to eat and to cook! This looks delicious! Thanks!